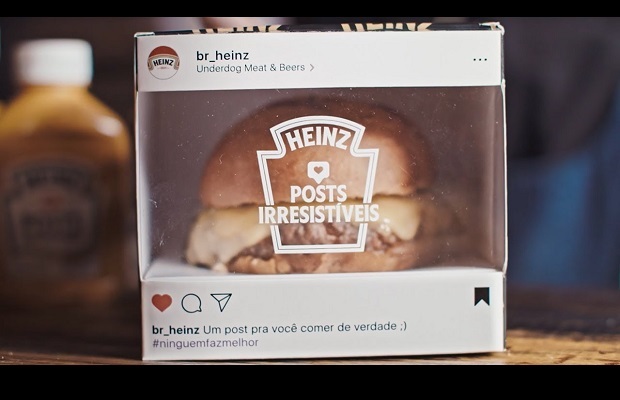 Two Procter and Gamble brands are among the top 10 advertisers using paid influencers with fake followers, while Heinz Ketchup is the most efficient brand on Instagram with a sub-$2 CPM, according to new research. 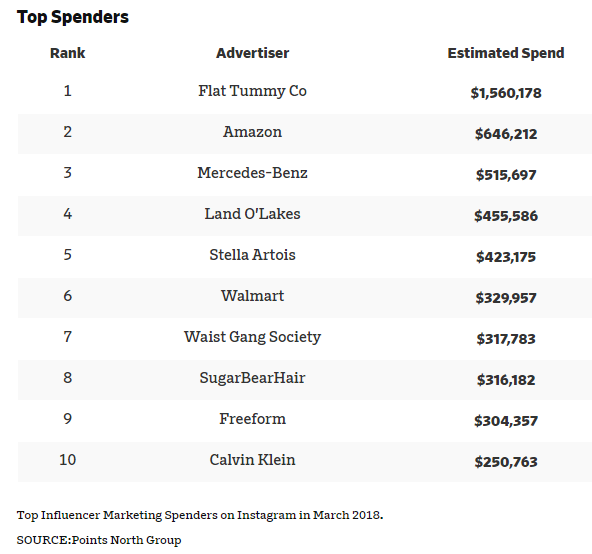 The study, from new analytics company Points North Group, shows which brands were the biggest spenders on Instagram influencer marketing in March 2018. The report also shows which were the most efficient, and which got most hurt by fake followers, in influencer marketing on Instagram, the dominant platform for sponsored posts. Seven of the Top 10 Spenders were large brands, with retailer Amazon (#2) outspending Walmart (#6). The sole automotive brand in the Top 10 was Mercedes-Benz (#3), the sole major beverage was Stella Artois (#5) and the sole major apparel brand Calvin Klein (#10). But three smaller brands made the Top 10, including Flat Tummy Co in the #1 slot, spending an estimated $1.6 million for the month. Heinz Ketchup got the most bang for its buck in March, achieving an effective CPM of just $1.78. 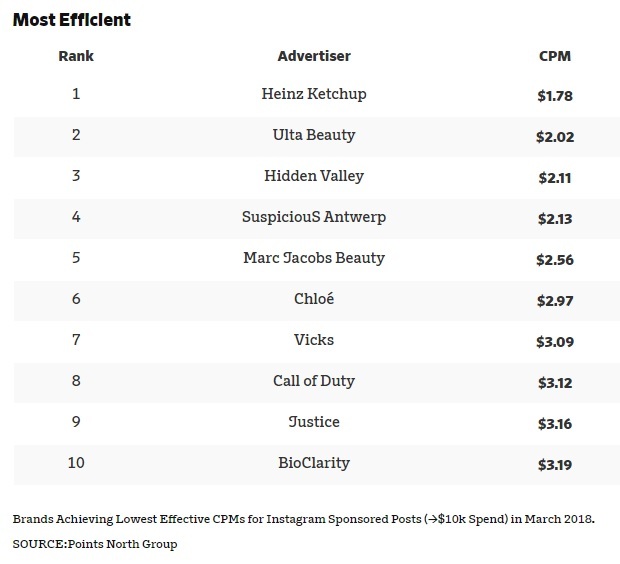 Mostly big brands made the Ten Most Effective list – including Ulta Beauty and Hidden Valley -- but smaller brands also proved savvy in the new channel, such as SuspiciouS Antwerp with a $2.13 CPM. Conversely, the Top 10 Spender paying the highest CPM in March was Land O’Lakes, at $32.06. Procter & Gamble, renowned for its savvy, had two brands among the Most Fake Followers. 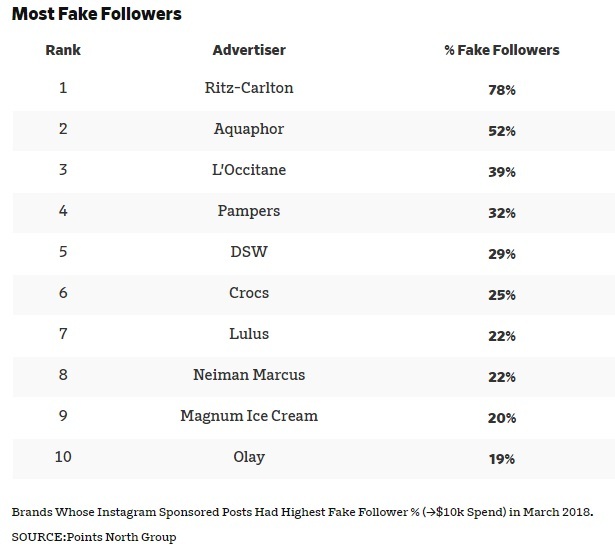 Number 4 Pampers’ influencers had 32% fake followers, and Olay’s (#10) had 19%. Ritz-Carlton’s influencers, however, had the most fake followers by far, 78%, meaning over three-quarters of the brand’s spending went to fraud. On the other end of the spectrum, the Top 10 Spender with the fewest fake followers was Freeform, with just 1%. “Brands have been putting real money into influencer marketing, but they’ve been getting poor measurement of its impact,” said Peter Storck, Co-founder of Points North Group. Points North Group will be releasing this data monthly. To track influencer marketing activity, Points North Group’s software analyzes sponsored posts on Instagram originating from accounts with at least 50,000 followers and that include the #ad or #sponsored tag; as not every sponsored post meets these criteria, this results in slight undercounting of posts and impressions. To estimate spend, Points North Group assumes “rate card” pricing of $0.003 per follower; actual price and pricing model differ by brand and deal. To estimate impressions, Points North Group uses a proprietary model built on verified influencer results; its definition of “impressions” is the traditional one -- actual eyes-on views -- not the definition used by those who equate impressions with follower count (i.e. potential impressions). To identify fake followers, Points North Group uses machine learning software, which identifies patterns that differentiate real accounts from purchased bots.